Louisiana fishing charter fans are probably wondering why we haven’t posted lately. Its been a while since I last posted a report and I’m sorry for that . I have been fishing quite a bit . We had a lil down time with Tropical Storm Lee pushing some water up and flooding the town I live in . Not a lot of water but just enough to flood the streets in the low areas. If you have never fished down here in south Louisiana after a hurricane or tropical storm you don’t know what your missing. The storms push salt water in and turns up the gulf so the fish push into the inland waters that we fish and its non stop action. The red fish have been schooled up and they are nice ones between 20-27″ The weather has taken a turn for the better the humidity is dropping and so has the temp. September is a good month to fish and October is even better. If you would like to book a trip to get in on this action contact me and lets get on the water and have a great day of fishing. 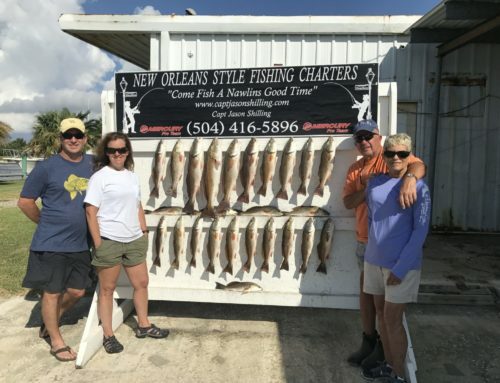 For a Louisiana fishing charter that can help you get that perfect catch, give us a ring!